Using notation from Notation for the Generalized Linear Mixed Model, the RANDOM statement defines the matrix of the mixed model, the random effects in the vector, the structure of , and the structure of . The matrix is constructed exactly like the matrix for the fixed effects, and the matrix is constructed to correspond to the effects constituting . The structures of and are defined by using the TYPE= option described on . The random effects can be classification or continuous effects, and multiple RANDOM statements are possible. Some reserved keywords have special significance in the random-effects list. You can specify INTERCEPT (or INT) as a random effect to indicate the intercept. PROC GLIMMIX does not include the intercept in the RANDOM statement by default as it does in the MODEL statement. You can specify the _RESIDUAL_ keyword (or RESID, RESIDUAL, _RESID_) before the option slash (/) to indicate a residual-type (R-side) random component that defines the matrix. Basically, the _RESIDUAL_ keyword takes the place of the random-effect if you want to specify R-side variances and covariance structures. These keywords take precedence over variables in the data set with the same name. If your data or the covariance structure requires that an effect is specified, you can use the RESIDUAL option to instruct the GLIMMIX procedure to model the R-side variances and covariances. Table 44.17 summarizes the options available in the RANDOM statement. All options are subsequently discussed in alphabetical order. You can specify the following options in the RANDOM statement after a slash (/). requests that a t-type confidence interval with confidence level 1 – number be constructed for the predictors of G-side random effects in this statement. The value of number must be between 0 and 1; the default is 0.05. Specifying the ALPHA= option implies the CL option. requests that t-type confidence limits be constructed for each of the predictors of G-side random effects in this statement. The confidence level is 0.95 by default; this can be changed with the ALPHA= option. The CL option implies the SOLUTION option. requests that the estimated matrix be displayed for G-side random effects associated with this RANDOM statement. PROC GLIMMIX displays blanks for values that are 0.
displays the lower-triangular Cholesky root of the estimated matrix for G-side random effects. displays the inverse Cholesky root of the estimated matrix for G-side random effects. The GCOORD=LAST option determines the coordinates for a level of the random effect from the last observation associated with the level. Similarly, the GCOORD=FIRST and GCOORD=MEAN options determine the coordinate from the first observation and from the average of the observations. Observations not used in the analysis are not considered in determining the first, last, or average coordinate. The default is GCOORD=LAST. displays the correlation matrix that corresponds to the estimated matrix for G-side random effects. displays the inverse of the estimated matrix for G-side random effects. identifies groups by which to vary the covariance parameters. Each new level of the grouping effect produces a new set of covariance parameters. Continuous variables and computed variables are permitted as group effects. PROC GLIMMIX does not sort by the values of the continuous variable; rather, it considers the data to be from a new group whenever the value of the continuous variable changes from the previous observation. Using a continuous variable decreases execution time for models with a large number of groups and also prevents the production of a large "Class Levels Information" table. Specifying a GROUP effect can greatly increase the number of estimated covariance parameters, which can adversely affect the optimization process. displays the number and coordinates of the knots as determined by the KNOTMETHOD= option. provides upper limits for the values of random effects used in the construction of knots for TYPE=RSMOOTH . The items in number-list correspond to the random effects of the radial smooth. If the KNOTMAX= option is not specified, or if the value associated with a particular random effect is set to missing, the maximum is based on the values in the data set for KNOTMETHOD= EQUAL or KNOTMETHOD= KDTREE, and is based on the values in the knot data set for KNOTMETHOD= DATA. determines the method of constructing knots for the radial smoother fit with the TYPE=RSMOOTH covariance structure and the TYPE=PSPLINE covariance structure. Unless you select the TYPE=RSMOOTH or TYPE=PSPLINE covariance structure, the KNOTMETHOD= option has no effect. The default for TYPE=RSMOOTH is KNOTMETHOD=KDTREE. For TYPE=PSPLINE , only equally spaced knots are used and you can use the optional numberlist argument of KNOTMETHOD=EQUAL to determine the number of interior knots for TYPE=PSPLINE . PROC GLIMMIX fits a low-rank smoother, meaning that the number of knots is considerably less than the number of observations. By default, PROC GLIMMIX determines the knot locations based on the vertices of a k-d tree (Friedman, Bentley, and Finkel 1977; Cleveland and Grosse 1991). The k-d tree is a tree data structure that is useful for efficiently determining the m nearest neighbors of a point. The k-d tree also can be used to obtain a grid of points that adapts to the configuration of the data. The process starts with a hypercube that encloses the values of the random effects. The space is then partitioned recursively by splitting cells at the median of the data in the cell for the random effect. The procedure is repeated for all cells that contain more than a specified number of points, b. The value b is called the bucket size. The k-d tree is thus a division of the data into cells such that cells representing leaf nodes contain at most b values. You control the building of the k-d tree through the BUCKET= tree-option. You control the construction of knots from the cell coordinates of the tree with the other options as follows. determines the bucket size b. A larger bucket size will result in fewer knots. For k-d trees in more than one dimension, the correspondence between bucket size and number of knots is difficult to determine. It depends on the data configuration and on other suboptions. In the multivariate case, you might need to try out different bucket sizes to obtain the desired number of knots. The default value of number is 4 for univariate trees (a single random effect) and in the multidimensional case. specifies whether the knots are based on vertices of the tree cells or the centroid. The two possible values of type are VERTEX and CENTER. The default is KNOTTYPE=VERTEX. For multidimensional smoothing, such as smoothing across irregularly shaped spatial domains, the KNOTTYPE=CENTER option is useful to move knot locations away from the bounding hypercube toward the convex hull. specifies that knot coordinates are the coordinates of the nearest neighbor of either the centroid or vertex of the cell, as determined by the KNOTTYPE= suboption. displays details about the construction of the k-d tree, such as the cell splits and the split values. See the section Knot Selection for a detailed example of how the specification of the bucket size translates into the construction of a k-d tree and the spline knots. You can specify a data set that contains variables whose values give the knot coordinates with the KNOTMETHOD=DATA option. The data set must contain numeric variables with the same name as the radial smoothing random-effects. PROC GLIMMIX uses only the unique knot coordinates in the knot data set. This option is useful to provide knot coordinates different from those that can be produced from a k-d tree. For example, in spatial problems where the domain is irregularly shaped, you might want to determine knots by a space-filling algorithm. The following SAS statements invoke the OPTEX procedure to compute 45 knots that uniformly cover the convex hull of the data locations (see SAS/QC User's Guide for details about the OPTEX procedure). The exterior knots are also evenly spaced with step size and start at times the machine epsilon. At least one interior knot is required. provides lower limits for the values of random effects used in the construction of knots for TYPE=RSMOOTH . The items in number-list correspond to the random effects of the radial smooth. If the KNOTMIN= option is not specified, or if the value associated with a particular random effect is set to missing, the minimum is based on the values in the data set for KNOTMETHOD= EQUAL or KNOTMETHOD= KDTREE, and is based on the values in the knot data set for KNOTMETHOD= DATA. reads the coefficient matrices for the TYPE=LIN(q) option. You can specify the LDATA= data set in a sparse or dense form. In the sparse form the data set must contain the numeric variables Parm, Row, Col, and Value. The Parm variable contains the indices of the matrices. The Row and Col variables identify the position within a matrix and the Value variable contains the matrix element. Values not specified for a particular row and column are set to zero. Missing values are allowed in the Value column of the LDATA= data set; these values are also replaced by zeros. The sparse form is particularly useful if the matrices have only a few nonzero elements. In the dense form the LDATA= data set contains the numeric variables Parm and Row (with the same function as above), in addition to the numeric variables Col1–Colq. If you omit one or more of the Col1–Colq variables from the data set, zeros are assumed for the respective rows and columns of the matrix. Missing values for Col1–Colq are ignored in the dense form. eliminates the columns in corresponding to missing levels of random effects involving CLASS variables. By default, these columns are included in . It is sufficient to specify the NOFULLZ option on any G-side RANDOM statement. requests that the solution for the random-effects parameters be produced, if the statement defines G-side random effects. The numbers displayed in the Std Err Pred column of the "Solution for Random Effects" table are not the standard errors of the displayed in the Estimate column; rather, they are the square roots of the prediction errors , where is the predictor of the ith random effect and is the ith random effect. In pseudo-likelihood methods that are based on linearization, these EBLUPs are the estimated best linear unbiased predictors in the linear mixed pseudo-model. In models fit by maximum likelihood by using the Laplace approximation or by using adaptive quadrature, the SOLUTION option displays the empirical Bayes estimates (EBE) of . identifies the subjects in your generalized linear mixed model. Complete independence is assumed across subjects. Specifying a subject effect is equivalent to nesting all other effects in the RANDOM statement within the subject effect. Continuous variables and computed variables are permitted with the SUBJECT= option. PROC GLIMMIX does not sort by the values of the continuous variable but considers the data to be from a new subject whenever the value of the continuous variable changes from the previous observation. Using a continuous variable can decrease execution time for models with a large number of subjects and also prevents the production of a large "Class Levels Information" table. specifies the covariance structure of for G-side effects and the covariance structure of for R-side effects. Although a variety of structures are available, many applications call for either simple diagonal (TYPE=VC ) or unstructured covariance matrices. The TYPE=VC (variance components) option is the default structure, and it models a different variance component for each random effect. It is recommended to model unstructured covariance matrices in terms of their Cholesky parameterization (TYPE=CHOL ) rather than TYPE=UN . If you want different covariance structures in different parts of , you must use multiple RANDOM statements with different TYPE= options. Valid values for covariance-structure are as follows. Examples are shown in Table 44.19. The variances and covariances in the formulas that follow in the TYPE= descriptions are expressed in terms of generic random variables and . They represent the G-side random effects or the residual random variables for which the or matrices are constructed. PROC GLIMMIX constrains the correlation parameters to satisfy . For variable-order ante-dependence models see Macchiavelli and Arnold (1994). PROC GLIMMIX imposes the constraint for stationarity. with . This covariance structure has the same correlation pattern as the TYPE=AR(1) structure, but the variances are allowed to differ. where and . PROC GLIMMIX imposes the constraints and for stationarity, although for some values of and in this region the resulting covariance matrix is not positive definite. When the estimated value of becomes negative, the computed covariance is multiplied by to account for the negativity. The elements of the unstructured variance matrix are then simply , , and . Similar operations yield the generalization to covariance matrices of higher orders. The GLIMMIX procedure constrains the diagonal elements of the Cholesky root to be positive. This guarantees a unique solution when the matrix is positive definite. The optional order parameter determines how many bands below the diagonal are modeled. Elements in the lower triangular portion of in bands higher than q are set to zero. If you consider the resulting covariance matrix , then the order parameter has the effect of zeroing all off-diagonal elements that are at least q positions away from the diagonal. Because of its good computational and statistical properties, the Cholesky root parameterization is generally recommended over a completely unstructured covariance matrix (TYPE=UN ). However, it is computationally slightly more involved. In the first case, the block*A random effect models the G-side experimental error. Because the distribution defaults to the normal, the matrix is of form (see Table 44.20), and is the subsampling error variance. The marginal variance for the data from a particular experimental unit is thus . 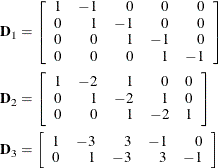 This matrix is of compound symmetric form. Hierarchical random assignments or selections, such as subsampling or split-plot designs, give rise to compound symmetric covariance structures. This implies exchangeability of the observations on the subunit, leading to constant correlations between the observations. Compound symmetric structures are thus usually not appropriate for processes where correlations decline according to some metric, such as spatial and temporal processes. Note that R-side compound-symmetry structures do not impose any constraint on . You can thus use an R-side TYPE=CS structure to emulate a variance-component model with unbounded estimate of the variance component. specifies the factor-analytic structure with q factors (Jennrich and Schluchter, 1986). This structure is of the form , where is a rectangular matrix and is a diagonal matrix with t different parameters. When , the elements of in its upper-right corner (that is, the elements in the ith row and jth column for ) are set to zero to fix the rotation of the structure. specifies a factor-analytic structure with q factors of the form , where is a rectangular matrix and t is the dimension of . When , is a lower triangular matrix. When —that is, when the number of factors is less than the dimension of the matrix—this structure is nonnegative definite but not of full rank. In this situation, you can use it to approximate an unstructured covariance matrix. A covariance matrix generally satisfies the Huynh-Feldt condition if it can be written as . The preceding parameterization chooses . Several simpler covariance structures give rise to covariance matrices that also satisfy the Huynh-Feldt condition. For example, TYPE=CS , TYPE=VC , and TYPE=UN(1) are nested within TYPE=HF. You can use the COVTEST statement to test the HF structure against one of these simpler structures. Note also that the HF structure is nested within an unstructured covariance matrix. The TYPE=HF covariance structure can be sensitive to the choice of starting values and the default MIVQUE(0) starting values can be poor for this structure; you can supply your own starting values with the PARMS statement. where denotes the element in row i, column j of matrix . requests that PROC GLIMMIX form a B-spline basis and fits a penalized B-spline (P-spline, Eilers and Marx 1996) with random spline coefficients. This covariance structure is available only for G-side random effects and only a single continuous random effect can be specified with TYPE=PSPLINE. As for TYPE=RSMOOTH, PROC GLIMMIX forms a modified matrix and fits a mixed model in which the random variables associated with the columns of are independent with a common variance. The matrix is constructed as follows. Details about the computation and properties of B-splines can be found in De Boor (2001). You can extend or limit the range of the knots with the KNOTMIN= and KNOTMAX= options. Table 44.18 lists some of the parameters that control this covariance type and their relationships. specifies the degree of the B-spline. The default is d = 3.
specifies the order of the differencing matrix . The default and maximum is r = 3.
specifies a radial smoother covariance structure for G-side random effects. This results in an approximate low-rank thin-plate spline where the smoothing parameter is obtained by the estimation method selected with the METHOD= option of the PROC GLIMMIX statement. The smoother is based on the automatic smoother in Ruppert, Wand, and Carroll (2003, Chapter 13.4–13.5), but with a different method of selecting the spline knots. See the section Radial Smoothing Based on Mixed Models for further details about the construction of the smoother and the knot selection. The exponent in these expressions equals , where the optional value m corresponds to the derivative penalized in the thin-plate spline. A larger value of m will yield a smoother fit. The GLIMMIX procedure requires p > 0 and chooses by default m = 2 if and otherwise. The NOLOG option removes the and terms from the computation of the and matrices when is even; this yields invariance under rescaling of the coordinates. Finally, the components of are assumed to have equal variance . The "smoothing parameter" of the low-rank spline is related to the variance components in the model, . See Ruppert, Wand, and Carroll (2003) for details. If the conditional distribution does not provide a scale parameter , you can add a single R-side residual parameter. The knot selection is controlled with the KNOTMETHOD= option. The GLIMMIX procedure selects knots automatically based on the vertices of a k-d tree or reads knots from a data set that you supply. See the section Radial Smoothing Based on Mixed Models for further details on radial smoothing in the GLIMMIX procedure and its connection to a mixed model formulation. is an alias for TYPE=VC. The parameter is not what is commonly referred to as the range parameter in geostatistical applications. The practical range of a (second-order stationary) spatial process is the distance at which the correlations fall below 0.05. For the SP(EXP) structure, this distance is . PROC GLIMMIX constrains to be positive. See TYPE=SP(EXP) for the computation of the distance . The parameter is related to the range of the process as follows. If the practical range is defined as the distance at which the correlations fall below 0.05, then . PROC GLIMMIX constrains to be positive. See TYPE=SP(EXP) for the computation of the distance from the variables specified in c-list. The function is the modified Bessel function of the second kind of (real) order . The smoothness (continuity) of a stochastic process with covariance function in the Matérn class increases with . This class thus enables data-driven estimation of the smoothness properties of the process. The covariance is identical to the exponential model for (TYPE=SP(EXP)(c-list)), while for the model advocated by Whittle (1954) results. As , the model approaches the Gaussian covariance structure (TYPE=SP(GAU)(c-list)). Note that the MIXED procedure offers covariance structures in the Matérn class in two parameterizations, TYPE=SP(MATERN) and TYPE=SP(MATHSW). The TYPE=SP(MAT) in the GLIMMIX procedure is equivalent to TYPE=SP(MATHSW) in the MIXED procedure. Computation of the function and its derivatives is numerically demanding; fitting models with Matérn covariance structures can be time-consuming. Good starting values are essential. where . This is a reparameterization of the exponential structure, TYPE=SP(EXP). Specifically, . See TYPE=SP(EXP) for the computation of the distance from the variables specified in c-list. When the estimated value of becomes negative, the computed covariance is multiplied by to account for the negativity. Note that for k = 1, TYPE=SP(POWA) is equivalent to TYPE=SP(POW), which is itself a reparameterization of TYPE=SP(EXP). When the estimated value of becomes negative, the computed covariance is multiplied by to account for the negativity. The spherical covariance structure has a true range parameter. The covariances between observations are exactly zero when their distance exceeds . See TYPE=SP(EXP) for the computation of the distance from the variables specified in c-list. This can be viewed as a moving-average structure with order equal to q – 1. The specification TYPE=TOEP(1) is the same as , and it can be useful for specifying the same variance component for several effects. The correlation parameters satisfy . If you specify the optional value q, the correlation parameters with are set to zero, creating a banded correlation structure. The specification TYPE=TOEPH(1) results in a diagonal covariance matrix with heterogeneous variances. The variances are constrained to be nonnegative, and the covariances are unconstrained. This structure is not constrained to be nonnegative definite in order to avoid nonlinear constraints; however, you can use the TYPE=CHOL structure if you want this constraint to be imposed by a Cholesky factorization. If you specify the order parameter q, then PROC GLIMMIX estimates only the first q bands of the matrix, setting elements in all higher bands equal to 0.
where denotes the standard deviation and the correlation is zero when and when , provided the order parameter q is given. This structure fits the same model as the TYPE=UN(q) option, but with a different parameterization. The ith variance parameter is . The parameter is the correlation between the ith and jth measurements; it satisfies . If you specify the order parameter q, then PROC GLIMMIX estimates only the first q bands of the matrix, setting all higher bands equal to zero. specifies standard variance components and is the default structure for both G-side and R-side covariance structures. In a G-side covariance structure, a distinct variance component is assigned to each effect. In an R-side structure TYPE=VC is usually used only to add overdispersion effects or with the GROUP= option to specify a heterogeneous variance model. requests that blocks of the estimated marginal variance-covariance matrix be displayed in generalized linear mixed models. This matrix is based on the last linearization as described in the section The Pseudo-model. You can use the value-list to select the subjects for which the matrix is displayed. If value-list is not specified, the matrix for the first subject is chosen. The subject effect for processing in this case is the A effect, because it is contained in the A*B interaction. If there is only a single subject as per the "Dimensions" table, then the V option displays an matrix. See the section Processing by Subjects for how the GLIMMIX procedure determines the number of subjects in the "Dimensions" table. The GLIMMIX procedure displays blanks for values that are 0.
displays the lower-triangular Cholesky root of the blocks of the estimated matrix. See the V option for the specification of value-list. displays the inverse Cholesky root of the blocks of the estimated matrix. See the V option for the specification of value-list. displays the correlation matrix corresponding to the blocks of the estimated matrix. See the V option for the specification of value-list. displays the inverse of the blocks of the estimated matrix. See the V option for the specification of value-list. specifies a variable to be used as the weight for the units at the current level in a weighted multilevel model. If a weight variable is not specified in the WEIGHT option, a weight of 1 is used. For details on the use of weights in multilevel models, see the section Pseudo-likelihood Estimation for Weighted Multilevel Models.